Email Subscribers provides an option to schedule a Newsletter / Notification email via Cron. In Newsletters and Post Notifications menu, you can set Mail Type option. If you want to schedule mail, you can select Send email via cron job option. If you selected this option, Email Subscribers will not send email immediately instead it will send email whenever your CRON URL is triggered. You can easily trigger this URL automatically using your hosting server. Contact your hosting and find how many mails you can send per hour. If they said you can send 50 mails, Set 50 in Email Count text box. Login to your server and schedule the cron job. If you are not familiar with it, ask your Server Administrator / Host Provider to set it up for you. How can I check if the scheduled cron jobs are properly executed? 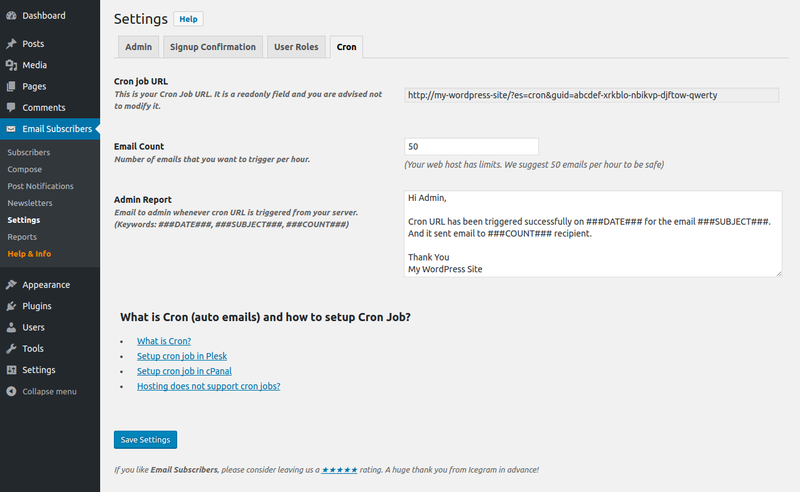 – Plugin will send one email to admin whenever the cron job is triggered successfully. Check the above screen, there is a option available to change the email content.